Perched high up on a palm tree was a little fern. Overlooking a café, she could see the barista. The gurgling. The hissing. The knocking. and slowly her image appears. It’s the highlight of the day. And she still smiles happy every time. - Fletcher's Front Yard Challenge - going native in front of your neighbours! 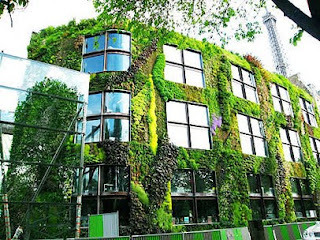 "The researchers ran computer simulations to determine how green walls and roofs might affect pollutant concentrations at street level. Adding plants to walls would cut nitrogen dioxide levels by 15 percent and small particulate matter by 23 percent, the authors estimate. In areas with little wind, those numbers could reach 40 and 60 percent. Green roofs didn’t perform as well because they don’t directly affect the air near the street. Trees also help clean the air, but they can keep street-level air from mixing with the air above. At low to medium pollutant levels, planting trees will still reduce air pollution, the team predicts. If a city is very polluted, however, trees could actually increase nitrogen dioxide levels near the street." Bird houses along entrance to Rockcliffe Flying Club and Yacht Club - does anyone know who put them up and who maintains them? There are also some bird houses in Rockcliffe (Sandridge and Hillsdale Road) - would it be the same individual/organization who put these up also and are any of these houses for specific birds? 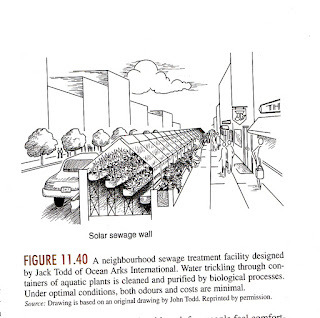 In my first semester Ecology and Environment text book, this picture of John Todd's "neighborhood sewage treatment facility" is an incredible design for a biocentric city. I love that it's shown right against a sidewalk in between pedestrians and the street. The description reads: "Water trickling through the containers of aquatic plants is cleaned and purified by biological processes. Under optimal conditions, both odours and costs are minimal." John Todd and his partner Nancy Jack Todd run Ocean Arks International. Some of their other design concepts show how these systems "harnesses the biological processes that operate in nature within the form of an engineered treatment system to successfully meet discharge standards and permitting requirements" and they are easily integrated into cityscapes. Follow the link to see the concepts: "sustainable water management". "Converting sewer sludge to fresh water is no easy job; traditional treatment plants consume massive amounts of money, energy, and resources. 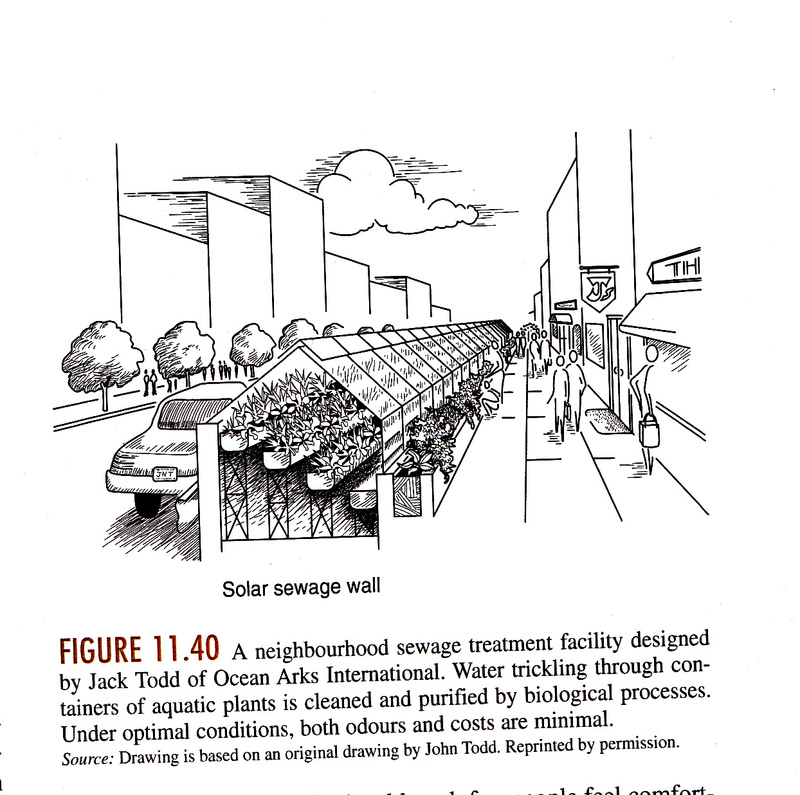 John Todd’s innovative solutions for waste-water management re-envision the process as an eco-conscious endeavor, conserving water and reducing overall treatment costs with minimal sludge disposal, water purchases, sewer surcharges, and chemical use." D & C's Biocentric Cities post is a monthly post that features options for energy and heating systems that would reduce our demand on natural and non-renewable resources outside the city (or in this one case - save energy). A city's consumption is many times its city limit size and impacts nature that we don't even see. My hope is that a city can produce its own energy, heat and clean water within its city boundaries. "Open fields in the heart of the forested Ozark hills are a precious commodity because not many exist, according to MDC Wildlife Management Biologist Ryan Houf. He said the fields play a vital role in wildlife management for bob white quail, swamp rabbits, cottontail rabbits, Eastern wild turkey, whitetail deer, elk, butterflies, insects, small mammals, and numerous song birds. To help restore the fields, encroaching woody plants and invasive species such as Johnson grass, fescue, sericea lespedeza, and autumn olive were removed. Fertilizer and lime were applied to the fields by local contractors. Once the fields were prepared, MDC staf used a no-till drill to plant the fields. “The higher quality forage will provide year round utilization by wildlife,” Ryan said. Cool-season grasses such as orchard grass and native warm season grasses such as big bluestem, little bluestem, gama grass, Indian grass, and switch grass were planted. To help offset future fertilizer costs, legumes such as clover and alfalfa were added into the grass mixes. The legumes add nitrogen to the soil and provide protein to wildlife and livestock that eat the forage. A winter cover crop of wheat, rye, or barley will provide wildlife green browse during the long winter months and also prevent erosion. All this work enhances wildlife habitat by reducing invasive plant species, replacing those plant species with more wildlife friendly plants that provide food, cover, and nesting habitat. By eliminating the invasive plant species, the watershed is improved and better protected as well, Ryan said." These fields are still used as hay fields but Parks and Conservation set "haying dates and mowing heights to better promote plant health and vigor and maintain open field sustainability for wildlife and plant species." 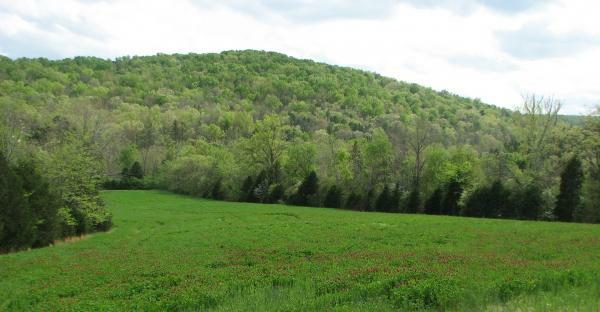 Really interesting project - read more here: Cooperative field restoration promotes local economy and wildlife habitat from MDC Online 2012. “The Nature of Cities” is a collective of contributors — an essay site devoted to cities as ecological spaces. It was launched this summer by Dr. David Maddox. 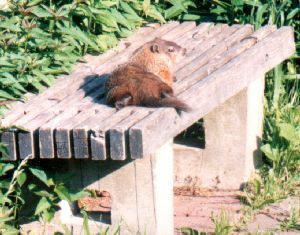 The contributors to this blog: "believe that nature in cities — by which we mean ecosystems, ecosystem function, biodiversity, ecological communities, and the habitats of species — needs more voices, more perspectives and expanded conversation about its critical importance and how it can be promoted, conserved, managed, and in some cases designed for the good of all." Read more here: The Nature of Cities. "Even tiny patches of woods in urban areas seem to provide adequate food and protection for some species of migrating birds as they fly between wintering and breeding grounds, new research has found...Stephen Matthews (is the) co-author of the study... with Paul Rodewald, an assistant professor of environment and natural resources at Ohio State...The researchers captured up to 91 Swainson's Thrushes at a woodlot on the Ohio State campus while they were migrating through Columbus in May or early June, 2004 to 2007...The sites had forest sizes that ranged from less than one hectare (1.7 acres) to about 38 hectares (93.9 acres) in size. Results (from radio transmitters that were glued on the birds) showed that at the five largest release sites, all the birds stayed until they left to continue to their migration north. At the two smallest sites (0.7 and 4.5 hectares), 28 percent of the birds moved to other sites in the Columbus region. The fact that a majority of the birds stayed at even our smallest sites suggests that the Swainson's Thrushes were somewhat flexible in habitat needs and were able to meet their stopover requirements within urban forest patches... The study revealed that the birds stayed at each site from one to 12 days, with the average being about four days. There was no difference in how long the thrushes stayed across the seven sites." ...It turns out that most birds were not picky and would stop at just about any greenway, regardless of vegetation, adjacent land use, or corridor width. 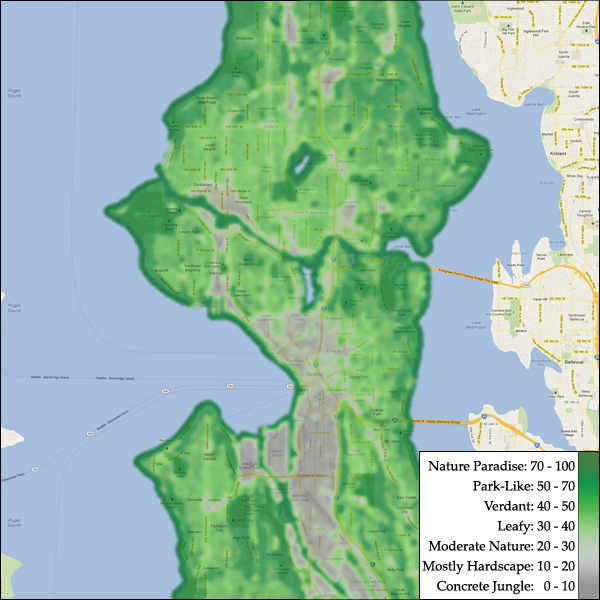 That’s not to say all greenways were entirely equal. Overall, birds favored corridors with taller trees and lots of native shrubs teeming with fruit. And among birds that live in forest interiors far away from human development and even open fields, greenways wider than 150 meters (about 500 feet) surrounded by low-intensity development were the most popular." Environment Canada has a publication on Area Sensitive Forest Birds in Urban Areas. This report discusses how to encourage breeding birds in the urban matrix, how to restore and enhance urban forests and how to determine if the habitat size is appropriate. 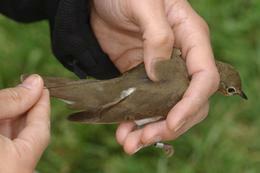 * Image of Bird Being Tagged from Wildlife Extra News: "A researcher fits a radio transmitter to a Swainson's thrush. They were attached with a special glue and fell off within weeks. Picture: Ken Chamberlain, Ohio State University"
This new website: Street Nature Score (designed in Beta for San Francisco and Seattle) rates neighborhoods by their access to nature just like the Walk Score rated areas by the amenities that were within walking distance. "Street Nature Score is brought to you by sustainable design strategist and educator Jeremy Faludi, of Faludi Design. By measuring urban nature, and making its benefits clear, we can help individuals, realtors, developers, and planners make cities more sustainable while also making them nicer places to live." 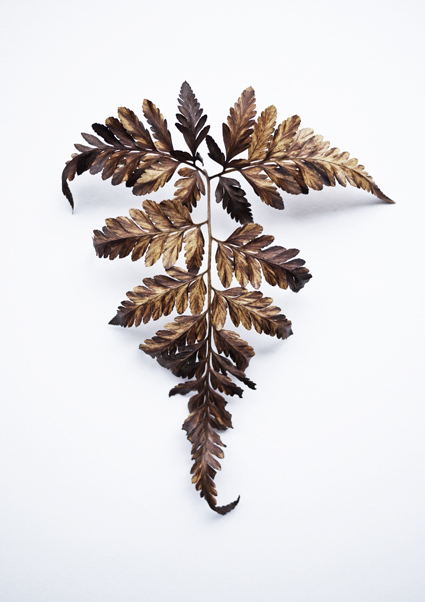 Check out the website to learn more about why "street nature" is valuable. * Image from Street Nature Score website.